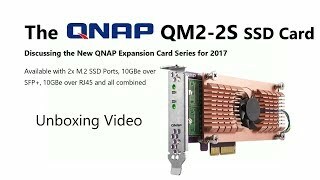 The QM2 series PCIe cards add support for M.2 SSDs and 10GbE RJ45 connectivity (optional) to a QNAP NAS*. 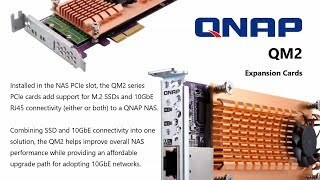 Combining SSD and 10GbE connectivity into one solution, the QM2 helps improve overall NAS performance while providing an affordable upgrade path for adopting 10GbE networks. Ideal for NAS with single PCIe slot to boost performance and connectivity. Up to two M.2 22110/2280 SSDs can be installed to form a RAID 1 or RAID 0 caching pool or auto-tiering volume. Enables SSD caching to boost performance and optimizes storage efficiency with Qtier Technology**. Provides 10GbE connectivity and backwards compatibility with 5GbE/2.5GbE/1GbE/100MbE (QM2-2S10G1T and QM2-2P10G1T only). M.2 SSD thermal sensors allow real-time M.2 SSD temperature monitoring. A quiet cooling module (heatsink and smart fan) minimizes risk of overheating and sustains constant high performance. LED indicators for monitoring M.2 SSD status. 6.Application Scenarios	 Used for predictable I/O workloads such as file/web/email servers, application virtualization or video editing. Used for highly frequent data access environment such as application virtualization or video editing. Used for applications requiring fast/intensive I/O such as databases or virtualized environments. 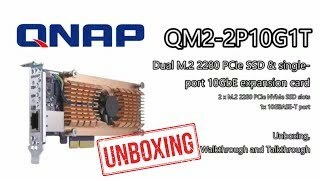 Read more about Qnap QM2-2P10G1T auto tiering. Quality expansion card! Really noticed the difference and appreciated the advice on which to get from Span as I almost bought the wrong one for my machine. Thank you! 5 stars!